For a long time, Remington was a maker only of rifles and shotguns. Bolt-action, pump and self-loading rifles and pump and self-loading shotguns. When I began gunsmithing, if someone had said, “Someday, Remington will be making handguns,” we’d have laughed coffee all over ourselves. 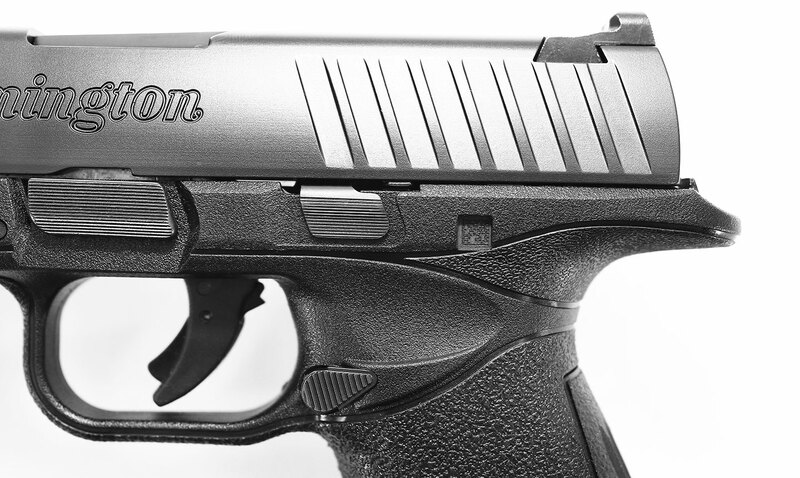 That day arrived a few years ago, and now Remington is making handguns for all the self-defense market segments. 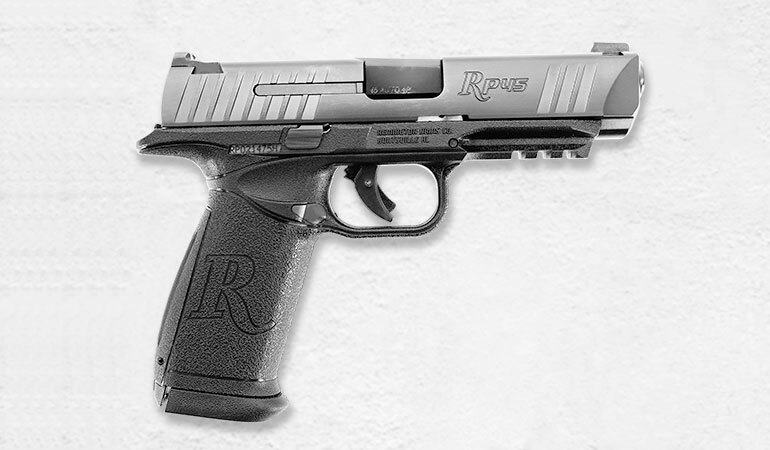 That’s how we come to the RP45, a striker-fired, polymer-framed pistol that holds a lot of ammo. OK, let’s get right to the crux of the matter: This is a big pistol. You can’t have a 15+1 capacity in .45 and replaceable backstraps without going big. So it is not a deep concealment pistol, unless your idea of daily wear is a parka or a serape. But big also describes the features list. It has a hefty slide to deal with the recoil and energy that a .45 ACP or, better yet, a .45 ACP +P load generates. The slide is given a pair of dovetails on top to mount the sights. Three-dot sights are standard, with three-dot night sights as an option. The rear sight has a vertical-faced blade so you can use it to work the slide in an emergency. While the likelihood of having to do this is small, it’s a good option to have. The front end of the slide has a heavy bevel on it for easy holstering. 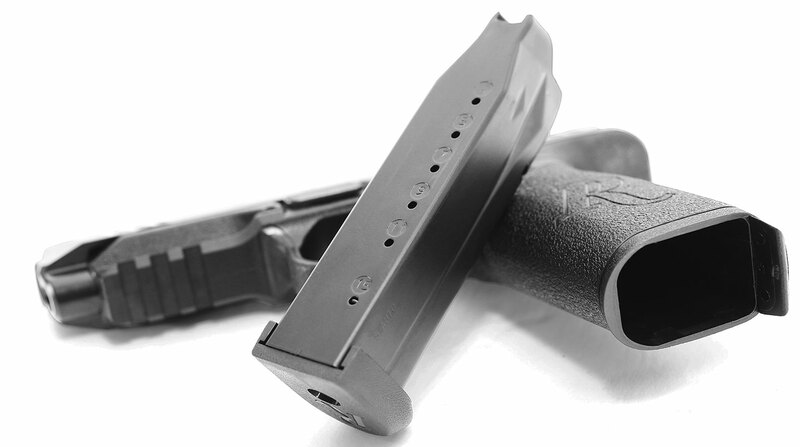 By making the front of the slide essentially a wedge, the RP45 will more easily “find” the open top of a holster. The cocking serrations are large but shallow, and while there are eight of them on the rear of the slide, there are only three on the front. You don’t need all eight up front, so that’s fine by me. At the rear of the ejection port, on the right side, is a veritable tow-hook of a spring-loaded extractor. It’s big, long and with plenty of leverage, so those empties are coming out of there whether they want to or not. The extractor also doubles as a loaded-chamber indicator. Inside the stainless steel slide is a linkless barrel, and the slide and barrel are both given a flat black PVD finish. PVD is the latest in firearms finishes, and it involves depositing a vapor of material onto the surface of parts in a vacuum chamber. It creates a thin, tough coating that does not build up on corners as some of the electro-deposit processes do, and it does not have the thickness that the baked paint coatings create. This means Remington can produce the slide, barrel and other parts to the dimensions it desires and not have to account for extra thicknesses created by the final coating. The striker system has all the expected safety parts. There’s a safety blade on the trigger, and a drop safety and striker block inside the slide. Since there is no hammer, the rear of the slide is sealed with a plate. The idea of striker-fired pistols is not new anymore, and shooters now are not all that keen on what we encountered with the pulls on the first ones, which were scratchy, creepy and gritty. The RP45 trigger is not something you’d pick first for a Bullseye match, but it’s much, much better than what we had in the old days. The published specs call for it to be 5.5 to eight pounds in weight, and the pull on my sample broke cleanly at six pounds. While the slide and its extras have a lot of goodies, it is the frame that holds the really interesting parts. For being big enough to hold a double-stack magazine filled with .45 ACP, it’s not as portly as I had expected. Oh, make no mistake, it’s a big gun, but it isn’t the monster blaster I had been expecting from seeing the photos. What’s the old adage? “The camera adds 10 pounds.” The camera is not kind to the RP45. The area behind the trigger guard is relieved, making it easier to reach the bladed trigger. The slide stop lever is ambidextrous, and the rear sight can be used to rack the pistol. Don’t worry, though. It is more manageable than you’d expect from the pictures. The inevitable comparison here is with the Glock 20/21, also a fat-grip .45, but the RP45 is slimmer and better-contoured than the Glock. The trigger guard has an undercut like on expensive, custom 1911s. This lets your fingers get higher on the gun. The rear of the frame has a sizeable tang on it, and this allows your hand to ride high and helps soak up the recoil of .45 ammo. The polymer frame has relief cuts on the sides, behind the trigger, to allow you to reach the trigger despite the size of the frame enclosing the double-stack magazine. Forward of that, Remington has thankfully made the trigger guard rounded—no squared-off trigger guard from the 1980s combat tastes—and large enough to fit a gloved hand. There’s an accessory rail on the dust cover for a light, laser or combo unit. The gun features an accessory rail, and the three slide serrations at the front provide an easy way to conduct a press check. 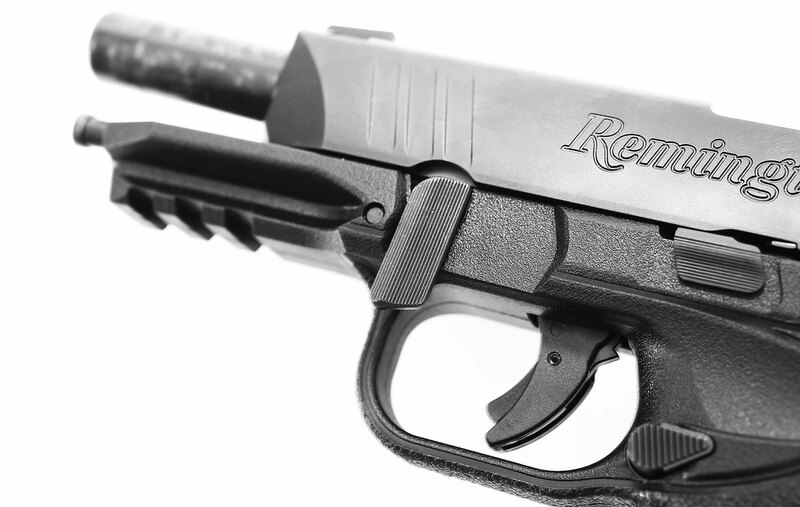 At the top of the frame, Remington has placed an ambidextrous lever for the slide stop, and the magazine catch is reversible so you can set up the handgun way you want it. The frame is finished in a pebble texture, with a script “R” in it, for a non-slip grip. And, thankfully, Remington has decided to not go with finger grooves. Hallelujah, brothers and sisters. I’ve yet to pick up a handgun with finger grooves in the grips or frame that actually fit my fingers. The serial number is on the chassis inside of the polymer shell, visible through a slot in the right side of the frame. The design would allow a trained armorer—not a shade-tree gunsmith—to swap the chassis from one shell to another should Remington decide to offer that option in the future or if the polymer shell became damaged and had to be changed. The gun comes with interchangeable backstraps, and all of them feature vertical grooves for improved control. For all of its size, the RP45 isn’t all that heavy, tipping the scales, empty with an empty magazine, at 29 ounces. That’s a few ounces more than a lightweight 1911 Commander and yet holds twice the ammo. The backstrap is removable, and the RP45 comes with three of them: small, medium and large. Each backstrap has a set of vertical grooves running three-quarters of the length of the backstrap. This is for more non-slip grip, and it accomplishes the job. The backstrap also comes down past the opening of the magazine well, and it acts as a back-face index, or magazine funnel, for speed reloading. 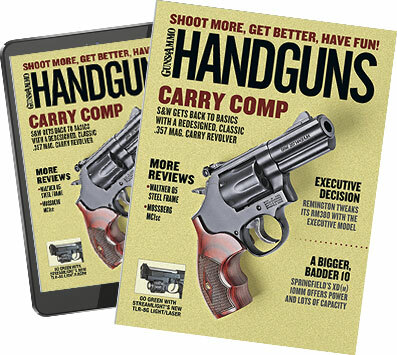 This is handy, as competitive shooters know, and for defensive handgunners it simply helps provide fumble-free reloads. The gun ships with three 15-round magazines, which are easy to load to capacity. The backstrap extension acts as a sort of mag funnel. The magazine base pads are oversized, so the contours of the pistols run smoothly from frame to magazine and back. On the front edge of the magazine base plate, it protrudes forward of the frame enough to give you purchase should you have to rip it out to clear something or do an emergency reload. The look of the RP45 is like that of the RP9. There are no sharp edges, no crisp corners, just flowing lines and a distinct lack of bits and pieces that could gnaw on your hands. We talk about a defensive or everyday carry pistol feeling like a used bar of soap, and the RP45 comes really close, right out of the box. The takedown process is simple. Unload the pistol. Lock back the slide. Rotate the takedown lever. Ease the slide forward to the locked position and dry-fire it. Hold the trigger back, and remove the slide off of the frame, sliding it forward. You can then remove the recoil spring assembly and barrel from the slide. The recoil spring assembly is a captured unit, so you needn’t worry about launching a spring across the room on disassembly. Shooting the RP45 produced no surprises. 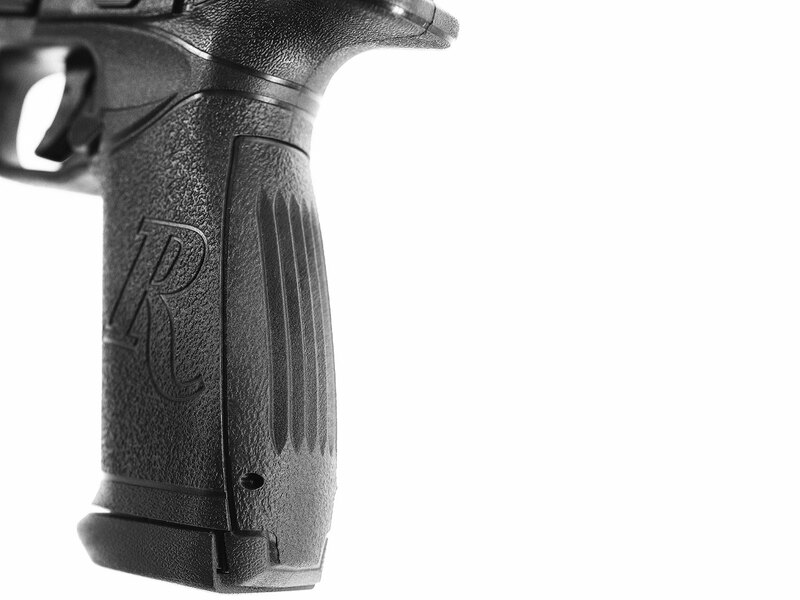 Given its size and the height of the bore over your hand, the RP45 is going to have muzzle rise. Big deal. USPSA/IPSC Grand Masters obsess over bore height, but in the real world of regular shooters, we worry about bore height entirely too much. The bore height over grip meant the sights lifted on each shot, but the non-slip grip, and the generous dimensions of the frame, meant the front sight came back down, centered in the rear notch, each time. The felt difference in recoil between the stoutest ammunition and the softest wasn’t much, and that is also a function of the generous frame. You’ve got a lot to hold on to, and there is a lot of surface area to transfer the jolt back to your hands and even out the recoil impulse. There were no malfunctions, and I would have been surprised, no, stunned, had there been any. A full-sized pistol firing .45 ACP is not exactly rocket science. The magazines are steel tubes, with tough polymer base plates, and are easy to load to their full 15-round capacity. The RP45 comes in a green cardboard box, with two magazines, a lock, an instruction manual and the extra backstraps. If what you want is a high-capacity .45 pistol, of the polymer frame and striker-fired persuasion—one that isn’t more than a handful—the RP45 might be just the ticket.